however, they do not look like the Vivian Girls exactly. The title of this piece is “The Best Band Ever”. 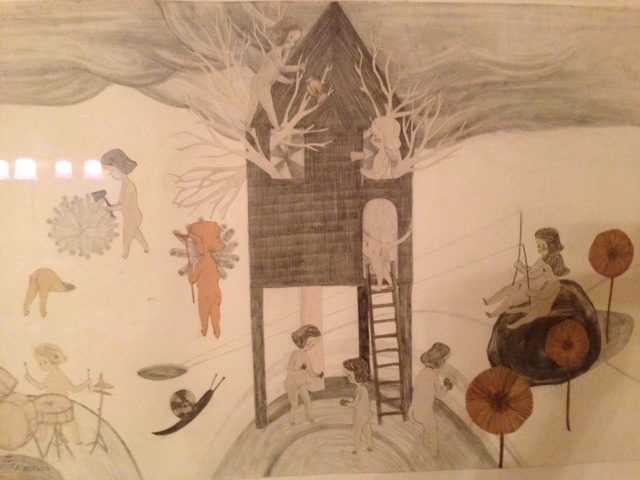 I am still trying to verify the artist, but have enjoyed learning about Henry Darger, who Natalie Merchant wrote a song about. I have been fascinated with this artist since I started the research and have reblogged the following post, which I stumbled upon in my research. The title is from the post which I reblogged. 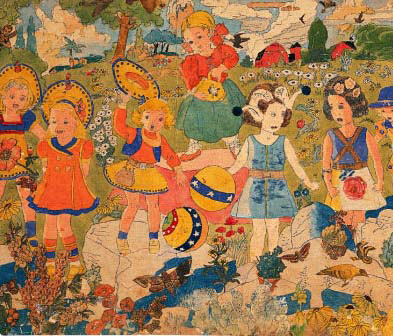 The writings, collages, drawings and paintings of Henry Darger have amazed viewers all over the world. His artwork explodes with color, patterns, landscapes, fantastic creatures, epic battles, evil Glandalinian soldiers and the brave Vivian Girl Princesses. Darger captured his world through a lifetime of art making and writing. He called his world the Realms of the Unreal. He produced a novel of over 15,000 typed pages and approximately 300 illustrations. Writing and art-making allowed Darger the freedom to express his views on issues such as: injustices against children, his relationship with God and the importance of protecting childhood innocence.